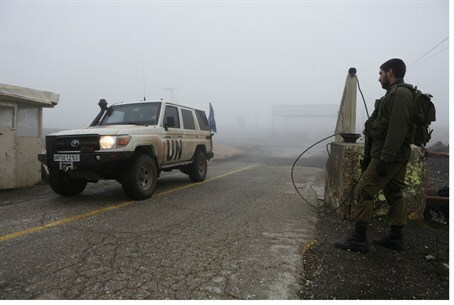 Croatia to withdraw its soldiers stationed on the Golan Heights as part of a UN force after reports of Syrian rebels receiving weapons. "After talks with President (Ivo) Josipovic I have initiated the withdrawal of Croatian troops from the Golan Heights," Prime Minister Zoran Milanovic told a cabinet session, according to AFP. The announcement came after the New York Times reported earlier this week, citing unnamed US and Western officials, that Saudi Arabia was supplying Syrian rebels with weapons bought from Croatia. "We can deny the reports as much as we want but that won't go anywhere," Milanovic said. "Our soldiers are no longer safe. We want them back home safe and sound." The newspaper reported that the Saudi-financed "large purchase of infantry weapons" was part of an "undeclared surplus" of arms left over from the Balkan wars in the 1990s and that they began reaching anti-regime fighters via Jordan in December. Since then, according to the New York Times, "multiple planeloads" of weapons have left Croatia, with one official quoted as saying the shipments included "thousands of rifles and hundreds of machine guns," as well as an "unknown quantity of ammunition." A Croatian foreign ministry spokeswoman told The Times that since the start of the so-called “Arab Spring” the Balkan country had not sold any weapons to either Saudi Arabia or the Syrian rebels. Saudi and Jordanian officials meanwhile declined to comment, the newspaper added. Croatia has nearly 100 soldiers serving with the UN Disengagement Observer Force (UNDOF) charged with monitoring a ceasefire between Israeli and Syrian troops on the Golan Heights.